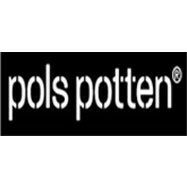 Pols Potten was founded in Amsterdam in the year 1986. Over the past 25 years they have enriched our lives with unique and exclusive designs, fit for every interior. Whether they are meant for your office or for your home. The moment you have laid your eyes on their collection, you will get “greedy”. Pols Potten is firmly rooted in the Dutch design tradition. All products are developed in studio PP. This studio is managed by designer Mr. Jan Wolleswinkel. That's Pols Potten for you. Flowerfeldt® can’t get enough of their creations, we are huge fans. And you?